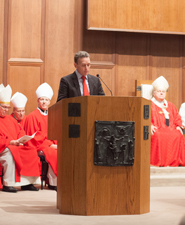 Bishop William A. Wack CSC offered the homily. 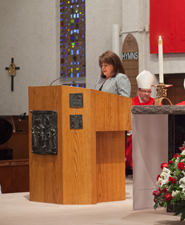 "We need the gifts of the Holy Spirit to remind us who we are," proclaimed Bishop Bill. Particularly, we ask for the gift of "Fear of the Lord", so that we may revere and adore God while remembering that we are called to do His will. Only when we &apos;get out of the way&apos; and let God work through us will God be glorified in us and in our world as well. 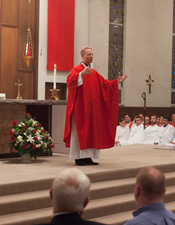 You can listen to Bishop Bill&apos;s homily by clicking here. Representative Colleen Burton, District 40, Lakeland, and Mr. Fred Springer, Esq. served as lectors at the Mass.